Time travel back to August 23rd. I am writing this report from the comfort of my NYC apartment. I spent the afternoon looking at some of my photos from Washington, Oregon and California to refresh my memory. It was nice to reminisce a little. This trip will stay with me for a very long time. I have the feeling that I will remember little details out of the blue in the middle of the day which will put me right back on the highway. Let’s get back to the trip from Bellingham to San Francisco. The weather was not the friendliest during my time in Bellingham and on my departure day. I chose to take highway 9/203/162 south instead of the horrible I-5 towards Mt. Rainier. This should be much less stressful and only a bit slower. The roads took me once again thru tiny towns along green fields with mountains not far. The roads were narrow and traffic was close to none existing. At least until I reached the outskirts of larger towns. I had to climb a couple of mountains which also meant a fast trip downhill. I did see the cop car on the bottom of the hill, waiting for all those speeders, but not in time to get to the proper speed. I believe I must have been going 75 mph in a 65 zone, luckily I did not get pulled over and there has been no ticket in the mail. It seems almost impossible to stick to the speed limit at those steep declines. Dead trees on hillside along Forest Service Road 99 surrounding Mount St. Helens. The trees died during the 1980 eruption of Mount St. Helens. completely hidden behind a thick cloud cover. I didn’t even bother to drive all the way to the base. I was disappointed that I didn’t get to see Mt. Rainier. Would I have been better of to drive thru the Olympic National Park over at the Pacific coast instead of traveling inland? I guess I will never find out. I decided to continue south to Mt. Saint Helens, hoping that the cloud cover would break. A woman at the visitor center near Mt. Rainier told me that it would be possible to get Cascade Locks, my destination for the day, on the Columbia River before dark. However, I should add at least an hour, each way, if I wanted to go to the viewing area along the eastern side of Mt. Saint Helens. The drive on highway 25 towards the mountain was winding its way thru the forest, a very slow process. There was a dash of sunlight coming thru the clouds and I turned right at the turn-off to the viewing area, a full hour away. It was a race against the disappearing sun. I was so close I at least wanted to get a glimpse of the mountain. 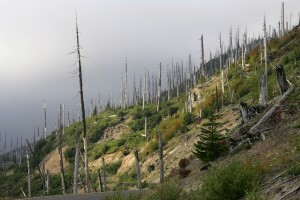 What I first saw were all the dead trees on the side of the mountains surrounding Mt. Saint Helens. They had been “killed” when St. Helens exploded back in the 1980s. It reminded me of all the dead trees in Yellowstone. Well, by the time I reached the viewing area the clouds had increased and I couldn’t see much of anything. At least I tried. Now the race with darkness began. The last thing I wanted to do was driving in the pitch black dark through the forest. I did not have many choices, there were no motels anywhere, and the closest campground put me quite a bit out of my way. Since I am somewhat stubborn, I headed towards Cascade Locks on the Oregon side of the Columbia River. Darkness once again came faster than expected. 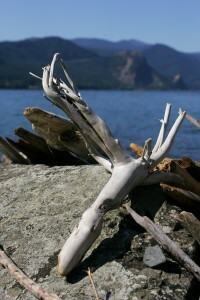 Driftwood along the Columbia River. when I checked in. The bathroom was pretty unique, no shower walls only a curtain which separated the shower from the toilet, one continues floor. The mattress was about 30” of the ground; a step-stool would have been helpful. At least the room was quiet and didn’t smell. The next day I explored the Columbia Gorge. 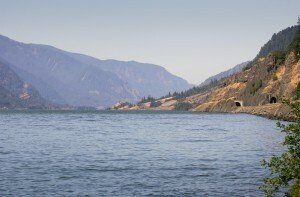 A beautiful stretch of the Columbia River between Portland and Mt. Hood. Reminded my of the Hudson valley, except the mountains were a little higher. 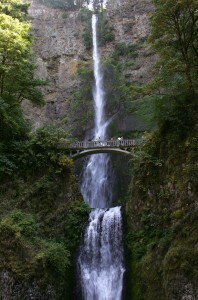 There are seven waterfalls along the route. All very skinny and after having seen two or three of them I did not stop anymore. Remember, I saw the big waterfall in Twin Falls. Off I went towards the Pacific Ocean, Cannon Beach. I was looking forward to driving down the coast and spending a little time at the beach. Not necessarily swimming, but just sitting at the beach enjoying the ocean. 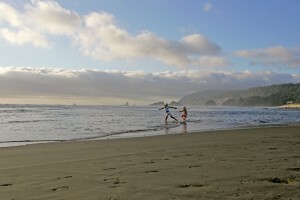 Cannon Beach is very nice, small, not too touristy, little artist community. Made it to the beach just before sunset. It was very windy and foggy. Looked neat, the fog was moving around the big boulders in the water. Got up really early the next morning and headed for the beach (I camped). Damn, totally cloudy, not nice fog, just gray clouds. Took me forever to find a place that was open for breakfast, it was before 8 AM! The drive down the coast was not as great as I had hoped. The weather was the biggest problem, gray, very windy and cold. No way that I would be able to hang out at the beach, not even in a warm sweater. Traffic was bad as well. Too many really slow drivers on a two lane highway can be extremely aggravating. I stopped in Tillamook, a big cheese town. I visited the cheese factory. I have a whole new respect for packaged cheese bricks. There is a lot of repetitive handwork involved until those little cheese bricks end up in the plastic bag. I talked to one worker and she told me that everyone has at least one of their wrist tendons fixed. By mid-day the skies had cleared. 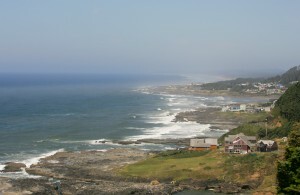 There were a handful of overviews along highway 101 with amazing views up and down the Pacific Coast. Long stretches of the highway were a little inland with no view of the ocean. Towards evening fog started to move in from the ocean. Within seconds the road was swallowed up by fog and it cleared almost as quickly. 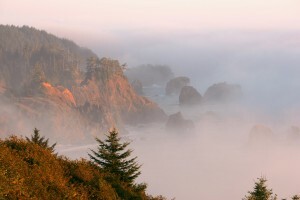 Samuel H. Boardman State Park – Fog covers the Oregon coast at sunset. I camped in the redwoods in Crescent City just south of the Oregon border in California. Thanks to my warm sleeping bag I didn’t notice that the temperature had dropped. The campground lay in fog and it was only 54F / 12C. Not really that cold, but with the moisture in the air it was finger biting cold. After a hardy breakfast I felt much better and headed to the Redwood National Park. You don’t realize how big those trees are until you see a skinny, little pine tree next to them. 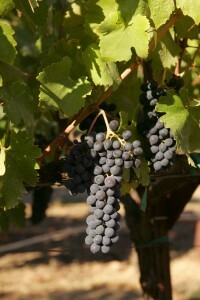 in Santa Rosa. I was looking for some local honey. Unfortunately, it was 6 PM on a Saturday and the stores were closed, how dare they. 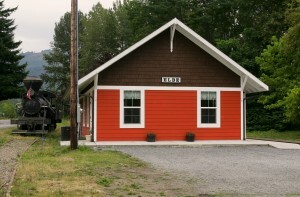 Cute place, especially the old downtown. I could not have asked for a better welcome arriving in San Francisco. Late afternoon sunlight giving the city a reddish glow, blue sky, light on the Golden Gate Bridge. All toped of by the moon above the city, wow. As it always goes no place to pull over. I got a crappy shot through the open window in stop and go traffic. After 1 ½ days in SFO off I went to Lake Tahoe, what a beautiful place. Kayaking on the lake, resting, spending time with friends. What a great way of life. This is the last trip report. Thank you very much for reading. I will send one more short e-mail with a trip recap, stay tuned. Would I do this again, definitely!